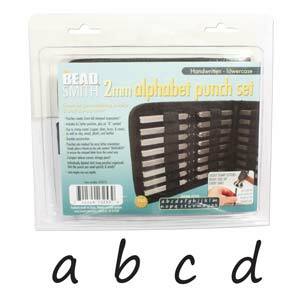 "• Includes A-Z letter punches, plus an & symbol • Use to stamp metal (copper, silver, brass, clay, wood, plastic & leather) • Punches are marked for easy letter orientation: Simply place a thumb on the side marked “BEADSMITH” to ensure the stamp is the correct way. • Durable construction and Compact deluxe canvas storage pouch • Individually labeled slots keep punches organized: find the punch you need quickly and easily! • Some letter heights or individual letter styles may vary slightly."